changed the world with what they did and this more or less, is their story. Director F. Gary Gray takes us through the years from the group’s origin in 1986 to Dr. Dre’s founding of Aftermath Records in 1996 and while it’s the N.W.A. 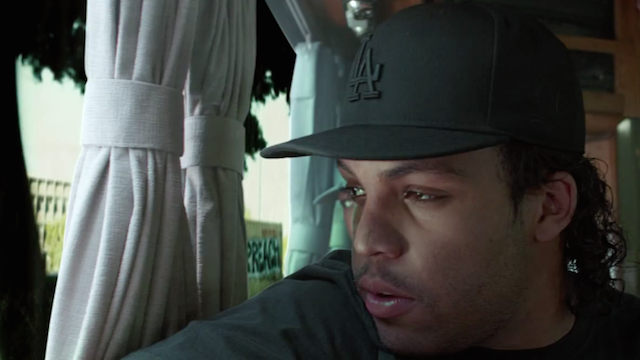 story..it’s mostly a three-man show focusing on Dre, Cube & most especially Eazy-E. It does justice in recreating a Compton from back in the day so perfectly and dare I say it, beautifully, as if the time & place and what the street life of the city truly was like, came straight out of a time machine. This is a big plus throughout the film. 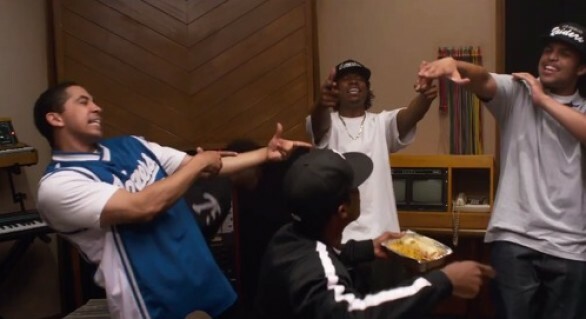 Opening with a drug deal gone bad for Eric ‘Eazy-E’ might seem somewhat cliched way to enter the story but is actually quite fitting especially since Eazy is the truly the main focus of the first half of film. He was the money, albeit it was from those deals, that enabled them to get studio time to record “Boyz in the Hood” and it was that song that attracted and brought manager ‘Jerry Heller’ (Paul Giamatti) to them. 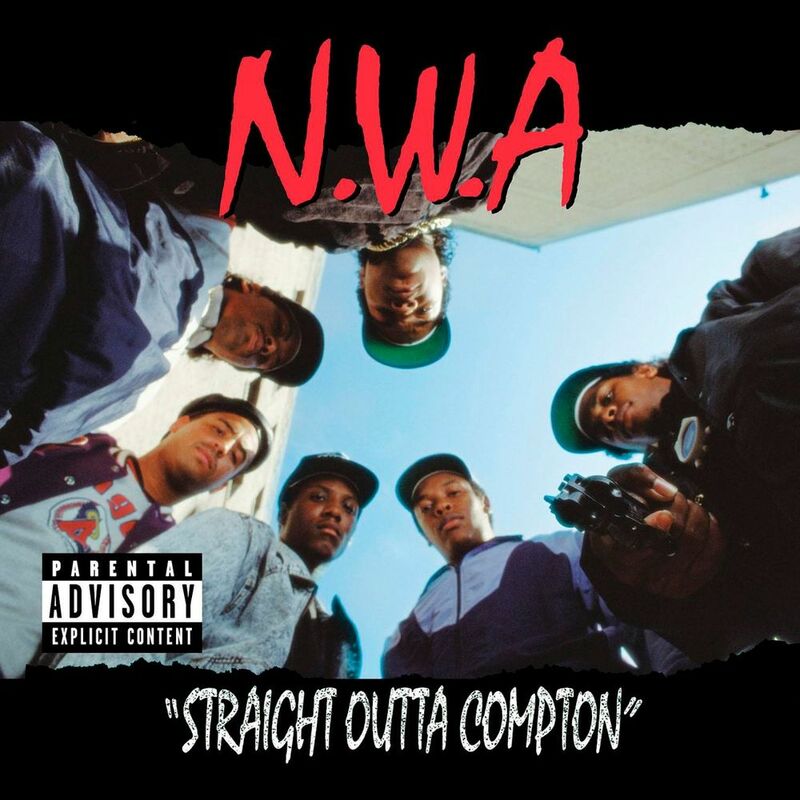 Heller knocks on the doors and pounds the pavement to connects them to their 1st label, Priority Records and we all get a laugh when we find out from that the only group ‘Bryan Turner’ (Tate Ellington) and the company had ever recorded before signing N.W.A was the California Raisins. Yep..you have dig real deep and go way back to remember that one!! But cash those checks from that Turner did, enough to land the company N.W.A. As we watch the group go from playing skating rinks to huge massive arenas across the nation. Meanwhile, Jerry also manages to finagle himself into part of starting up Eazy-E’s Ruthless Records where we see everyone but E get underpaid & overlooked. This leads to acrimony between the guys and while on tour Ice Cube, reminding everyone that he is the one who has written most of the music, departs the group. But before he leaves though we do get the anthem that penned the groups title as ‘the world’s most dangerous group‘ mainly because they scared the bejesus out of middle America with their anthem “F**K the Police” which comes straight from Cube after we witness multiple scenes of humiliation and harassment of not only him, but the group, their friends, their neighbors for just basically being. The movie clearly focuses on the big three of the group, ‘Dr. 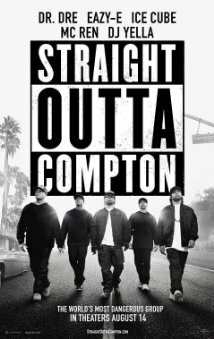 Dre’ (Corey Hawkins) and ‘Ice Cube’ (O’Shea Jackson Jr.) with ‘Eazy-E’ (Jason Mitchell) taking the lead, with ‘DJ Yella’ (Neil Brown Jr.) & ‘MC Ren’ (Aldis Hodge) getting only minor attention. They easily brush right over their misogynistic lyrics as women here are barely given the time of day and only the wives or girlfriends of the moment get a few lines at best. Though as with most bio-pics, while we might not be getting the complete story here – it’s still a very good story. We see bits of the infamous East Coast/West Coast rivalry that started up. And once Cube is gone we get right in the middle of his lyrical riffs with the remaining members of the group badmouthing each other back n forth through their music giving us surely what is only a glimpse into this and then with Dre also going his own way with the ever and still unscrupulous ‘Suge Knight’ (R. Marcos Taylor) – showing the forming of and his subsequent abandonment of Death Row Records. We catch beginning snippets of ‘Tupac Shakur‘ (Marcc Rose), ‘Snoop Dogg’ (Keith Stanfield) (or as his character notes – that’s Snoop D. O. double G.), ‘Jimmy Iovine’ (Mark Sherman) & the beginnings of Interscope Records. 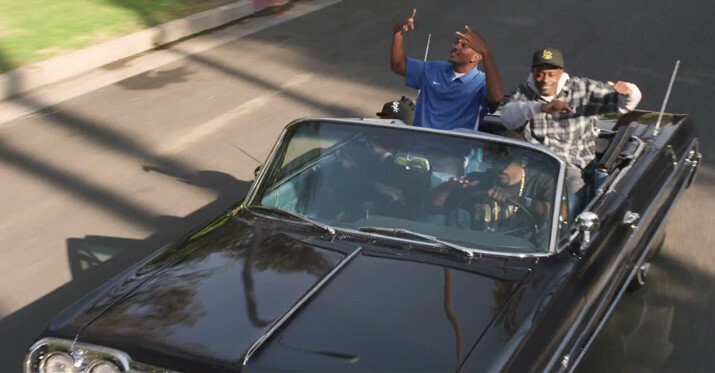 Along with this, we get clever allusions to what is to come – Everything from Cube’s films ‘Boyz N The Hood’, ‘Friday’ and it’s sequels, to Dre when walking out on Knight, almost cheesily referencing Aftermath. The film closes with updates on the band members careers post-1996 with various interview clips in large focusing on Dre and Cube’s successes, Kendrick Lamar, Eminem, and 50 Cent, among others, paying homage to Dre showing the fruition of what both his and Cube’s visions came to be. Also, the sad and untimely passing of Eazy-E from AIDS. Noticeably absent are updates on DJ Yella and MC Ren. For all it’s small flaws here and there, this is still a hellava story to be told. N.W.A helped to change the musical culture of the time because they actually told the world what was happening in their own backyard through their music. And in doing so they succeeded in making themselves one of the most powerful groups of the time. Oscar buzz? Probably not. But fan favorite (and one of mine) – definitely.